At the well-timed advice of a fellow reveler, I endeavored to work in a little semolina, a flour often reserved for pasta. I loosely followed a recipe I found on cookistry.blogspot.com (semolina-flax-honey bread) but I used a warmed milk and honey wash about five minutes before the bread was done baking to get a slightly darker crust. Semolina is made from durum wheat, and is said to lighten otherwise heavy (usually as with whole grain) breads. It’s mighty tasty in this loaf, and I’m sure I will rendezvous with it again soon. UPDATE: for the first time, I’ve posted a recipe online (down there, below the picture). Hope you enjoy! Feedback invited (nay, begged for). Although I have a whole host of helpful cookbooks I frequently refer to, more and more I find myself borrowing from several reliable sites online. For that reason, it’s important to me to have a recipe that’s clear, accurate, and gives proper due. Let me know if you try this recipe (or some version thereof), and if this can be tweaked/improved at all. Here was my version of this great recipe from Cookistry.com (bounteous site for various bread recipes and bread making techniques). My changes were largely due to simply running out of time since I was baking in between life, and other things. Set aside the egg wash and flax seeds. Put all the other ingredients except the water together in a food processor. With your food processor on, pour the cold water in as fast as the other ingredients will absorb it. Keep the food processor going until it forms a ball and then about another half-minute after that. Take your dough ball out, and briefly knead it on a clean, floured surface (it always matters to knead your own dough, even if it’s just long enough to give it that human touch). Form it back into a ball. Oil the bag and put your dough ball in it, turning it to coat before putting it in cold storage overnight. After the requisite twelve hours (mine turned out to be closer to 20), take the bag out and let it sit until it comes to room temperature. (This should only take a couple hours — because of intermittent tasks, mine rested for closer to four hours). Sprinkle a baking sheet with cornmeal, and set the oven to 350 degrees. Knead the dough briefly on a clean, floured surface and form it into the desired shape. Place it on the baking sheet, cover it lightly with plastic wrap, and let it rise until doubled, about another 40 minutes (yes, for me this was closer to an hour). To score your bread, take a sharp, thin kitchen knife, and make any desired slashes. The pros use a lame. I don’t have one of those and my scoring is satisfactory for me. Sharp small serrated knives, or even razor blades, will do the trick to score the bread so that you have created a tear in the bread and the heat of the oven doesn’t just pick the weakest point and tear there. Cookistry didn’t call for this but I nearly always score mine. Hearth breads like this one, baked on a sheet, not in a bread pan, call for scoring but it’s typically not necessary for bread pans. I do it anyone, sheet or pan, because I like the way it looks, it gives the crust peaks and valleys (not quite for mouthfeel but more for mouth experience). For the egg wash, with a fork, briskly stir together one egg and one tablespoon cold water. Using a pastry brush, brush the egg wash all over the bread, trying not to let any of it drip/run down the sides or pool in the scored indentations. Generously sprinkle light flax seeds all over the tops and sides. For the milk wash, which gets applied 5-10 minutes before your bread is done (closer to ten minutes if you want a darker crust since the sugars in the milk and honey darken the crust)After about 30-35 minutes, apply the milk wash, which is just a little bit of milk (approx. 1/4 cup) with a touch of honey (I heat these together in the microwave). Then drizzle a little olive oil on top. Give it a quick stir, then use the pastry brush to apply it, keeping in mind that you will get a bit of browning if the milk wash meets the bread at the bottom of the pan. The little bit of crunch that results from this can be a pleasant surprise (but of course if left in the oven too long, it’s called burnt). Experiment a little, and see what you like. When your loaf is done, let it cool on a rack. I especially like this bread toasted but keep that in mind when you’re shaping it or it may not be toaster friendly. Lovely warm or just plain as a breakfast treat with a touch of butter. The crust has a subtly sweet flavor, nicely accentuated by the nuttiness of the flax seeds. I could smell that bread from here just looking at the picture! Yum!! I have been known to go through half a loaf of semolina bread fresh from the bakery. The Italian bakery where I used to live made it in a brick oven. 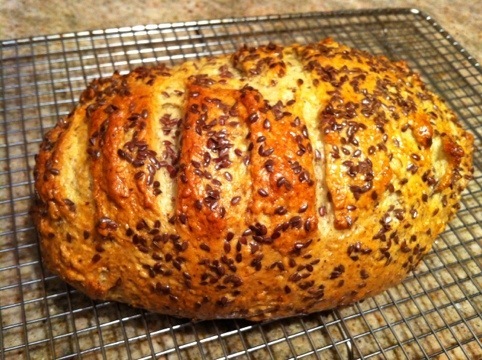 It was a plain loaf with sesame seeds on top shaped like a dome. They had a machine that cut the whole thing into thin slices. I would start at one end and work my way toward the middle- slice by slice. Good times! If you eat pasta try making some with semolina. I forget the amounts, but it’s just flour, eggs, salt, water, and some oil. You could probably find a store that has it fresh if you want to give it a try before making it. It cooks real fast since it’s not dried out like the boxed stuff. Breads, pasta, and pancakes are a couple things easy to make, much cheaper home made than store bought, and much better tasting, and better for you. If you have a lot of saved herbs make an herb bread! My zone which had been 6AorB (never remember which) is now 7A. This may effect what you are planning to grow, so check it out.